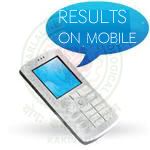 Get jntu kakinada results to your mobile. Get the performance details of every individual student studying in the colleges affiliated to JNTU kakinada. send @jntuk To 9297777777 and you will get the menu containing latest available results from JNTUK. Select the desired option and send your roll number. For getting the performance details of individual student,just send @jntuk.agg <space> roll_number. Still In Confusion Regarding this . . . . , Just Leave A Comment At The Bottom . . . . !